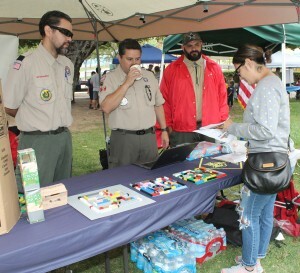 District Mission Amigos Chair Bob Gin and Paul Wong welcomed hundreds of Cub Scouts and Boy Scouts to their Second Annual “Cub-O-Ree” and “Crub Camp” held in Barnes Park. 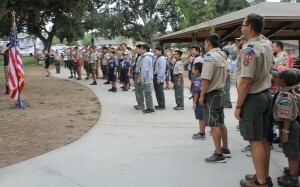 The Scouts all stood at attention to salute our flag in troop formation. 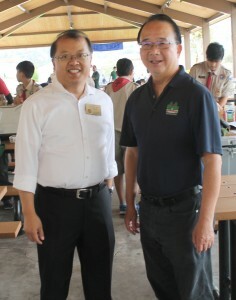 Paul Wong welcomed all of the scouts and thanked them for attending this event. Have fun and enjoy the grub. 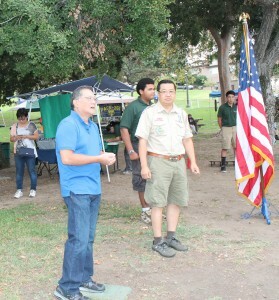 Bob Gin welcomed the scouts and their families to this wonderful event. The scouts and their families were reminded the Scouting has been around since 1910. They should always follow the Scout Laws. 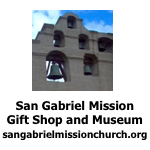 District Mission Amigos includes all scouts living in Monterey Park, Alhambra, San Gabriel, Rosemead, El Monte and South El Monte. 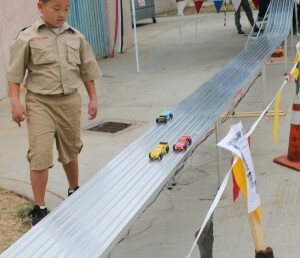 Scouts from Troop 301 helped to host this event and provided a fantastic car racetrack. 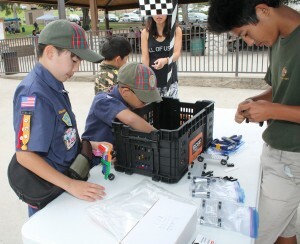 Scouts had a chance to build a Lego car and try their hand a speed. 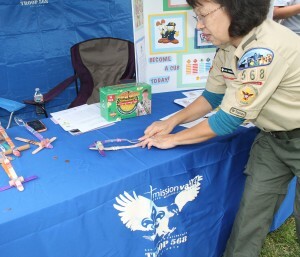 Troop 301 from Shepherd of the Hills United Methodist Church was celebrating their 100 years of Scouting Traditions. They also hosted a hot dog lunch for all to enjoy. 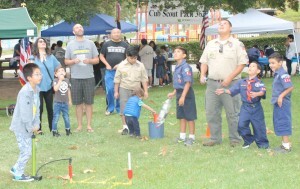 Each troop hosted games for all to enjoy. Water rockets were the greatest attraction as each child had a chance to push a level to shoot the water bottle rocket into the sky. Several troops displayed hand built launchers to shoot pennies into the air. 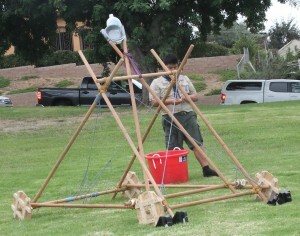 One troop built a large water balloon launcher to shoot their balloon onto people visiting the event. 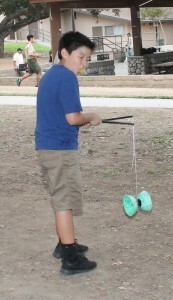 Other troops had games of toss, fishing, Chinese checkers and a Chinese historical game. 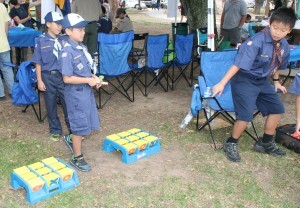 The prizes were candy to the delight of the scouts. 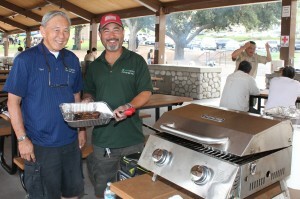 Councilmember Mitch Ing and Councilmember Peter Chan jointed the party. Mitch Ing recalled his many years working with his son’s troop in the city. 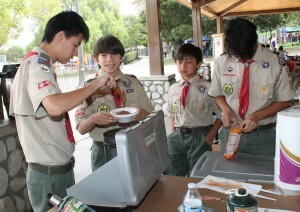 Peter Chan agreed to be one of the judges for the Crub Contest. 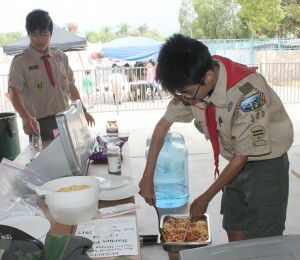 The contestants cooked or grilled Ribs, Egg pasta, Eggs and sausages and two kinds of chili…. hot and hotter. Judges volunteered to enjoy these wonderful meals were Firefighter Dan Cline, Councilmember Peter Chan, Fire Captain Shane Reilly, District Executive Leon Tsoi and Firefighter Mark Olivas. Each committee presented their meals to the judges hoping to win the contest. The judges were introduced to the cooks as their votes were being counted. 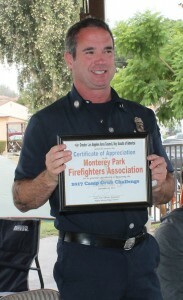 Captain Reilly accepted an award from the District Mission Amigos for their participation. The winners were announced by Patrols since each troop was divided into patrols of eight boys. Space Invaders, Pajama Men, Mechanical Sharks, Water Patrol, Oscar Garcia and Jorge Banuelos. Each group received an award for their winning dishes. 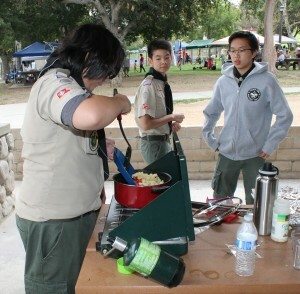 Some scouts used this event to earn a merit badges. 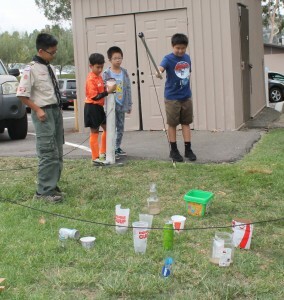 Cub Scouts and Boy Scouts is open to boys in the 1st through 8th grade through schools, churches and service clubs in the United States of America. Scouting is a longstanding American tradition.